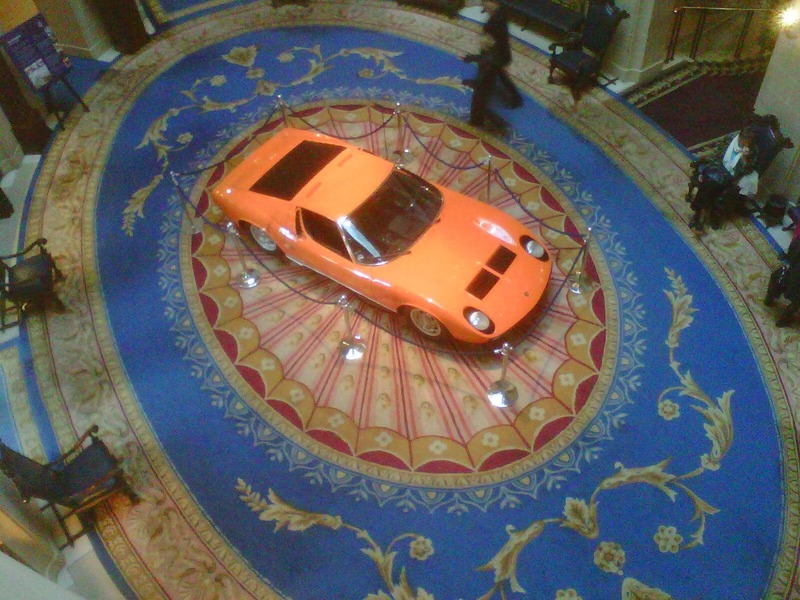 Arriving at the RAC for the annual conference, I was delighted to find that they had managed to arrange for an example of my dream car to be on display in the lobby. How did they know? While there were many familiar faces in the Mountbatten Room when the conference got under way, there were also a number of notable absentees - retirements have taken their toll - but we also had many new faces. Conference books contained copies of the speakers' slides (the tyranny of PowerPoint is impossible to avoid), but this report of what the speakers said should help with their understanding of the slides - and also alert those who were not present to what they missed! The first speaker was Etienne Kairis, a Partner in the Belgian firm Liedekerke, who spoke about dealer protection in Europe. He began by reminding delegates that provisions that had appeared in earlier block exemptions, back to 1985, giving protection to dealers. Initially it was said that they were designed to promote competition. In Regulation 1475/95 protection was continued and arbitration was added as a mandatory way of dealing with disputes, and protection was reinforced in Regulation 1400/2002. The Evaluation Report and the subsequent Impact Assessment in 2008 to 2009 concluded that these provisions had no effect on competition. Indeed, it was even thought that they might be counterproductive because they made it difficult for the manufacturer to adapt its network to changing conditions. The new block exemption therefore removed protection for dealers. Instead, dealers were to be protected by provisions included in voluntary Codes of Conduct. The Code of Conduct produced by ACEA and JAMA asked members to insert provisions in their dealer agreements on minimum notice and arbitration. The alternative Code of Conduct produced by CECRA, on the other hand, reinstated the protection given by the block exemption in full. Etienne considered that it was logical for dealer protection measures to be removed. The block exemption creates a safe harbour for dealer agreements but it does not create rights or obligations. His view was that it is better to deal with terminations under national contract laws. He had advised a small Japanese manufacturer a few years ago when they were withdrawing from the EU market, and in the course of doing so he co-ordinated a review of national laws throughout the European Union. He was therefore able to tell the conference that some countries have no laws on the subject, some have very specific rules (for example, Belgium), and others apply the rules that protect commercial agents. The Netherlands, France, Italy, the UK, and others have no specific rules on the subject. France has a “corrective general principle” or requirement for good faith, and similar principles may apply in other countries. His review of the dealer agreements operated by Japanese and Korean manufacturers in those countries showed that notice periods and other dealer protection provisions were still present, but there was no goodwill indemnity. In the second group of countries, Belgium has the law of 1961, under which the case law indicates that a terminated dealer may be entitled to over two years’ notice. The Belgian law also provides for a goodwill indemnity if the dealer can show that he has increased sales for his brand and clients will stay with the dealer. (I wonder how on earth you could prove that.) Compensation will be calculated on the basis of the gross margin for one year. In Austria, there is a specific law for the automobile sector which was introduced in July 2013. Etienne described it as a cut and paste of the old block exemption. Luxembourg has draft legislation which is currently stuck in parliament. In the third group, Germany, Portugal and Greece apply the agency law by analogy. As for the future, Etienne drew attention to the resolution of the European Parliament last year calling for the protection given to commercial agents to be applied to motor dealers as well. From the chair, David Evans gave a brief outline of the CECRA position, stressing the importance of protecting the unamortised investment of the dealers. Our second speaker, Adrian Watts, began by remarking on the swing of the pendulum compared with 15 years ago when he had had a conversation with a speaker from the Office of Fair Trading over lunch at the conference and all the talk was of the need for dealers to be protected from manufacturers. Now the OFT’s focus appears to be on the growth of dealer groups. Adrian began from the assumption that the United Kingdom leads the way with consumer protection legislation. If that assumption is correct, how much adjustment will be needed to comply with the Consumer Rights Directive? He noted one more recent change in the legislation, dealing with hidden surcharges in online transactions and promoting transparency for customers. The legislative timetable for the Consumer Rights Bill was disappointing, but he remarked that this was inherent given the limited lifetime of parliament. Already the UK is late in implementing the directive. Turning to regulatory issues, Adrian asked whether the demise of The Office of Fair Trading would make a difference and thought that it would probably not. But he thinks that the Competition and Markets Authority, and perhaps other new regulators, are pushing the pro-consumer message too hard and putting off industry. In particular, he pointed out that the CMA is saying that its predecessors have used the regulatory powers rather than criminal powers too much, suggesting that the CMA will be more heavy handed and will not restrict the use of criminal sanctions to repeat offenders. This heavy-handed approach was apparent in the commercial vehicle investigation, where there were no flagrant or repeated breaches. The authority’s actions were very public as they mounted dawn raids and dragged people off to police stations. The Office of Fair Trading had made some high profile efforts to deal with the problem of pay day loans. It identified that the issue is mostly concerned with rollover and renewal loans, meaning that there is actually no competition: the consumer has no option but to go back to the original lender to take out the rollover loan. This also means that there is no incentive for the lender to make any effort to check on the affordability of the loan and irony of the situation is that it is in the lender’s interest to have the borrowers not pay. In the payday lending market, the cost is almost irrelevant as far as the borrowers are concerned, and now the regulators will look not only at cost as the basis of competition but also speed and availability. The same message about transparency also crops up in the context of online gaming. This is another area where there is a distinct lack of information about charges. This market involves children playing online games using their parents’ log in and credit cards. The Consumer Protection Regulations are particularly relevant in such a market, and have been applied many times where consumers are vulnerable. What is the relevance of this to the motor industry? Adrian pointed out that the fact that buying a car is a huge outlay to the average consumer, and a transaction which they enter into infrequently, and that this raised important questions about transparency. Do sales people have the requisite knowledge of the consumer to ensure that the terms of the dealer really are transparent? Staying on the subject of computer games, Adrian focused on their function as data collection exercises. Once again drawing conclusions relevant to the motor industry, he asked whether the industry tells consumers enough about what it does with the data that it collects from them, and with whom it shares them. The industry was going to have to keep this area under review, because as the use of telematics becomes more and more widespread, an increasing amount of data is being streamed backwards and forwards between the car and the manufacturer or the workshop. In addition to this, financial and prospecting data also need to be kept under regular and frequent review. What might be compliant today might not be tomorrow, and the industry will be making a big mistake if it left it a year before reviewing its policies. The OFT had taken action against United Carpets, over dubious special offers and perpetual closing down sales, and this has lessons for the used vehicle market particularly with regard to trade ins. The OFT now insists that special offers are measured against some typical offers, as the offers that were described as special were not really special. The motor sector certainly has its fair share of special offers as well, and these featured in the commercial vehicles’ investigation. These recent developments show that in offering something on what purported to be special terms there has to be a benchmark. While the United Carpets case might show the bigger picture, the investigation of Nixon & Hope shows the smaller picture. This was a consumer website which quoted a VAT exclusive price and on which the reduction in the price was miscalculated. There were clear breaches of the price marking obligations and the Consumer Protection Regulations applied. Undertakings from the company ensured that no prosecution was brought. There are only a couple of major matters under way at present, one involving galvanised steel tanks and the other sports bras. The latter involves alleged resale price maintenance, and it appears that discussions might have taken place between manufacturers and retailers, some of whom were big players and should have known better. The OFT/CMA seems to be quite gung-ho about prosecuting. The issue of gym membership contract terms has largely been settled on the basis of undertakings, but LA Leisure insists that its terms (18 month initially, with a possible break after 12 months subject to payment of a fee) were clear enough to comply with the CPRs. He said that it is very interesting to see how the OFT has managed to get a whole industry to change its practices. Has this any relevance for the motor trade? Adrian thought it does, with the issue of transparency again being paramount and also the issue of time the customer does long term finance deals. Some clarity about the definition of a consumer is provided by the case of Overy v PayPal, which concerned the Unfair Terms in Consumer Contracts Regulations. One problem is that there are simply too many definitions of the consumer, and therefore too much variation. In that case, the consumer decided to sell his house through an online lottery with collection of the proceeds through PayPal. His undoing was that part of the premises were used for a business, so he ticked the box provided by PayPal to say that it was a business transaction. When PayPal learned of the situation they decided that there was a breach of the agreement so they closed his account, which prevented the lottery from going ahead. He sued them for £1 million, which he claimed was his loss, arguing that he was a consumer selling his private residence so even if the terms were breached he had protection under the Unfair Terms in Consumer Contracts Regulations. The fact that the property was mixed use was irrelevant and he was still entitled to protection. The High Court asked why he had declared it as a business transaction, and observed that a consumer had to be transacting mainly as a consumer. The Court said that the business use would have had to negligible for it to be a consumer transaction, and as it was not, he was outside the consumer test. The Court also thought (obiter) that PayPal’s terms and conditions appear to comply with The Unfair Contract Terms Act. Turning now to the use of criminal and regulatory proceedings, Adrian pointed out that regulatory proceedings are often quicker. He pointed as evidence to the Compass case, where in 2009 there was a conviction under The Consumer Protection Regulations and subsequent proceedings under the proceeds of crime legislation took place some years later. Last year an Order was obtained to recover £209,000 against the proceeds of the criminal activity which were in the order of £900,000. Finally, Adrian focused on the Advertising Standards Authority, which he said is now taking a front seat role in how things are presented to the consumer. Two cases were relevant to the motor industry, he thought: the first concerned Kronenbourg, a brand owned by Heineken, which was described in advertising its French beer. It was brewed in the UK, though a small proportion of French hops was used. The advertiser claimed that this was a minor technicality but the ASA said that it was misleading and unsubstantiated, so there was a breach of the CAP Code. His other example was a series of Renault advertisements which focused on the brand’s Frenchness. In particular, a scene with the Moulin Rouge dancers was the subject of a complaint and in spite of it being one complaint out of three million hits the ASA held that there had been a breach of the CAP Code on the basis that it caused harm and offence. The advertisement for the BMW Mini with the picture of a car with streaks behind it suggesting speed was considered by the ASA to encourage irresponsible driving. To close, he showed the audience an American advert for the Jaguar F-Type complete with the disclaimer explaining that it had been filmed on a closed course with a professional driver and containing a plea to viewers to obey speed limits. After coffee, the conference heard from barrister Alex Rozycki of 4-5 Gray’s Inn Square who talked about Clause 13 of the Intellectual Property Bill which will create a new criminal offence of unauthorised copying of a registered design. He said this was unwelcome news for the design industry but welcome news for the criminal bar. The new offence will be limited to registered designs, which protect the appearance of a product, and the offence would only be committed if the act concerned is carried out in the course of business. Criminalisation of intellectual property infringements is not new: Alex pointed to Section 92 of The Trade Marks Act and Section 110 of The Copyright Designs and Patents Act. However, in the registered designs field it is much more controversial than it ever was with trademarks or copyright. Does it create particular problems? He suggested that requiring infringement to be considered in criminal proceedings was not good news. The government argues that Clause 13 meets its obligations under the TRIPS Agreement, Article 61. This requires minimum protection against wilful and deliberate behaviour on a large scale, but it does not go so far as the mandate criminal sanctions. Small, up and coming design practices which cannot afford the irrecoverable costs of civil litigation, will benefit from the existence of criminal law protection too. The Public Bill Committee reported to the House of Commons on 30 January. The third reading of the Bill is now awaited. If, as seems likely, the Bill becomes law, it will mean that nuanced questions about infringement will go to juries, which will find them very difficult. There will be risks of miscarriages of justice, and Alex suggested that there would be a chilling effect on the design industry. If the burden shifts onto the accused to make out the defence, as it deems would be necessary under the decision in Re Johnstone, there will be a potential for miscarriages because the evidence may emerge after trial. The introduction of the “basic intent” element may provide some comfort, making innocent mistake a defence even if it is foreseeable. Clause 13 requires intentional copying. It provides for three statutory defences. The defence originally required copying, which implied a mental element. Intention is now incorporated. Basic intent is a concept in criminal law: intentional copying, not intent to copy, would be the test. Mere recklessness would not suffice. But is basic intent all that the prosecution will have to show? Looking back at the TRIPS Agreement, it specifically mentions wilfulness as an element. Under Section 92 of The Trade Marks Act mental element requires acts to be done with a view to sale or distribution. Would it be necessary to prove a civil infringement before criminal liability arises? The Johnstone case suggests that the answer is yes, even though it is not referred to expressly in the clause. This means that civil infringement issues will have to be decided on by the criminal jury. Johnstone suggests that the Defendant would have to bear a persuasive burden, and discharge the evidential burden of showing that the defence applies. This is very different from, for example, a self-defence plea in other areas of the criminal law. The clause will provide for statutory defences that the accused have a reasonable belief that the design was invalid, which is an objective test. Iain Larkins, now of Radius Law, spoke about changes to the cartel offence and his own experience at Mercedes Benz of dealing with a cartel investigation. He told the audience that that had made for an interesting day in the office, and he painted a vivid picture of the theatricality of the event: police officers wearing bomber jackets, frogmarching their suspect out of the office, police cars drawing up outside, the individual being searched. The director concerned had had dental surgery during the morning and had not eaten for 24 hours. While the police held him, he was given a meal which contained only 250 calories, being held in the cells for several hours, interviewed, and released about 8 o’clock. The Office of Fair Trading’s scorecard as far as cartel prosecutions are concerned is very unimpressive. They have one win, the marine hoses case, which was not really a UK case at all as was dealt with here only as a result of a plea bargain in the United States. Against that, the British Airways case was a major defeat for the OFT. Nevertheless, the authorities make a big thing of cartel investigations. Iain referred to a cleverly choreographed publicity exercise, with the news of the raids being given to the media in time for the Radio 4 Today program. The cartel offence as originally introduced in the Enterprise Act imposes a dishonesty test. The Office of Fair Trading has found it difficult to satisfy the dishonesty test, and has managed to persuade the government that it should be removed. This is strange, because in the two cases that have been caught, dishonesty was not even raised in the Marine Hose case and the BA trial collapsed without the dishonesty test even being considered. Nevertheless the change will be made on 1 April as a result of the Enterprise & Regulatory Reform Act. Immunity will still be available, on the first past the post principle. It will also remain the case that arrangements which have a competitive effect may nevertheless amount to an offence. Iain observed that in the United States, where cartel activity has been criminalised for many years there has never been a dishonesty requirement. Iain then spoke about the second BA surcharge case, which involved cargo rather than passengers. The executive involved, Keith Packer, was jailed in the United States in October 2008 for eight months, and is now active on the speaking circuit giving what Iain described as a very convincing tale of woe. His story is that he merely chaired meetings at which discussions took place about where British Airways should pitch their surcharge and questions were asked about what competitors were doing. One member of the committee volunteered information about what competitors were doing, and unknown to Mr Packer, who thought that it was public information, it was coming from illegal meetings with the competition. He pressed the Office of Fair Trading to prosecute him in the UK, and when prosecuted in the US had no real alternative but to enter into a plea bargain. Another Defendant took on the Department of Justice rather than take the eight month sentence, and was sentenced to ten years instead. Next Iain referred to the Advocate General’s opinion in a case on umbrella pricing, the situation where non-cartel members take the benefits of the cartel pushing up the prices. The question is whether consumers who have bought at inflated prices from non-cartel members should have a claim against the cartel and the Advocate General says yes they should. How a cartel investigation is handled can make a huge difference to the outcome. Iain had trained the Board at Mercedes Benz in August 2010 so they knew how to deal with dawn raids, but it was sheer coincidence that it was only four weeks later that they experienced one. Dealing with the investigation raises a number of practical issues. It is important to provide refreshments to the investigating officers, otherwise they are likely to make their own way to the canteen and while they are there they will talk to the people they encounter, which inevitably will include the one person in the company who talks too much. He also explained that instructing a local criminal solicitor turned out to be beneficial. He knew the local custody sergeant and understood how local police worked. A high powered criminal lawyer brought in from outside would have been unfamiliar with local practice. He also stressed the importance of agreeing the wording of an email to be sent round the office well in advance rather than waiting for the problem to arise and doing it on the day. If IT functions are outsourced, that could create a problem and a careful look at the contract with the service provider would be useful. If the Service Level Agreement provides for a three day response time that could be disastrous. It is also important to make sure that the Press Office is set up to deal with an investigation, and a statement for the press should be drafted now rather than waiting for the problem to arise. In most companies the finance team is bigger than the legal team, and comprises people with a similar professional competence, who may be the best people to use a man marker while an investigation takes place. It is important that the facilities team is able to provide enough passes for the investigating officers, and to make meeting rooms available. In a decision (  UKICO FS505209970) by the Information Commissioner, a complainant requested information about a vehicle for which she is the registered keeper. The information requested related to what information had been given to Liverpool City Council about the vehicle, and the Driver and Vehicle Licensing Agency refused to provide the information under sections 21 and 40 of the FOIA on the grounds that it was available by other means (a data subject request under the Data Protection Act). The Information Commissioner found that the requested information is the personal data of the complainant and therefore is indeed exempt from a FOIA request under section 40(1). Investigation: Is pre-reg rife? The manufacturers give us their views - Car Dealer Magazine: "February 6, 2014"